Each Knife Is In compostable wrapping! Need Other Cutlery? Click Here. 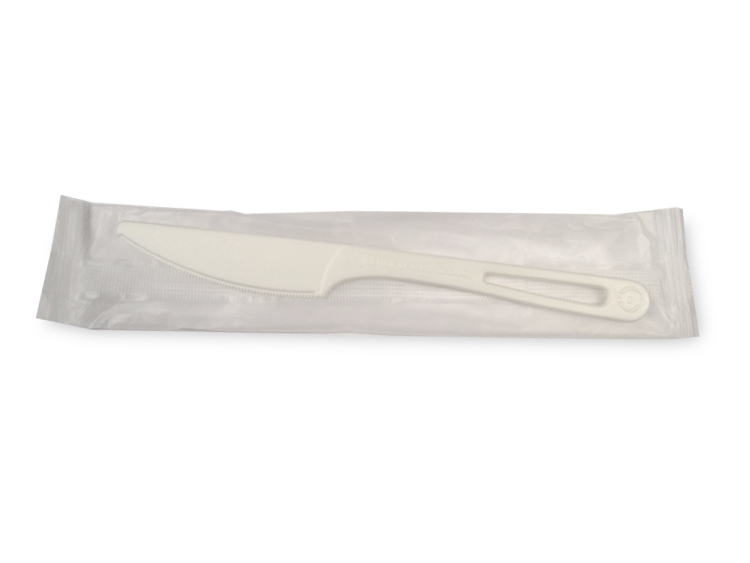 Our new utensils are made from TPLA 70% non-GMO PLA and 30% talc. They are also heat resistant up to 200 degrees F, and are certified under ASTM-6400 standards and now have BPI Certification. Most current utensils on the market made from plant starch are NOT compostable. Current technology does not allow for manufacturing plant starch utensils without adding some plastic fillers. These are normally priced cheaper and do not meet compostability standards. 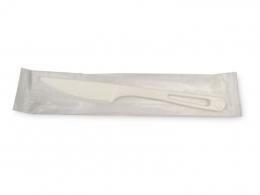 Please be aware that these plant starch utensils are not compostable or biodegradable. These utensils will take 120+ days to compost in a commercial composting facility. Home composting is not recommended and it may take 1-2 yrs to compost in a home composting system. *The Tear Drop shaped opening in the handle of our cutlery is the trademark of World Centric Corporation.